Delicious apple bread formulated for the smallest of beaks. No large berries or seeds; all ingredients are petite-sized for little birds. Apple Orchard Spice Bread is perfect for: budgies, parakeets, parrotlets, conures, cockatiels, lovebirds, mini macaws. A blending of 3 wonderful certified organic flours: hemp seed, garbanzo bean, and kamut flours. 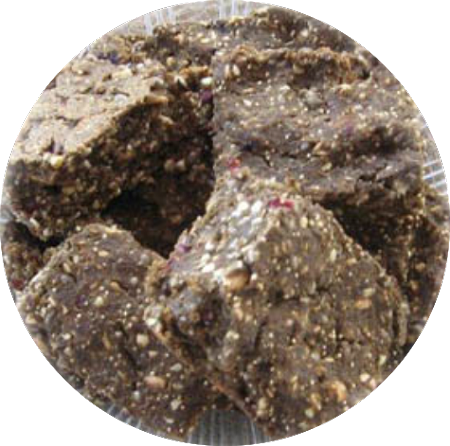 Sesame, hemp and poppy seeds, along with buckwheat and fine coconut add even more nutrients. Our superior quality organic apple powder enhances nutrition and taste. Apple powder is made with local B.C. organic apples; imparting the crisp taste of fresh picked apples! Spiced to perfection with healthy pungent ginger, lemony hibiscus and Ceylon cinnamon. *Photo shows Apple Orchard Spice Bread after cooking and ready to serve. *Simply add a well beaten organic egg and 1 1/2 cups water. Mix well, prepare glass baking pan with coconut oil, hemp oil or extra virgin olive oil. Press firmly into pan. Bake at 325 for 40-45 minutes. Yields 1 large 9" x 13" pan. Freeze left overs for hectic days!g instructions are on each package - simply add an organic beaten egg and water. Garbanzo bean flour, hemp seed flour, kamut flour, spelt flakes, hemp seed, amaranth grain, sesame seeds, poppy seed, buckwheat, apple powder, fine coconut, hibiscus, ginger, Ceylon cinnamon.